Cats are known for being very clean animals. Whether you are currently training your cat to use the litter box or you have adopted a pre-trained adult cat, make sure do you part of the bargain and clean the box daily. Many new cat owners make the mistake of leaving waste in the litter box for days, which will deter your cat from eliminating in his designated spot. This can also make litter-box training a more difficult process. Additionally, if you need to change the type of litter you use, do so incrementally so as to allow your cat to adjust to the new odor and texture. Omitting important health treatments for your cat can leave him in pain and leave you with high vet bills and lots of unnecessary headaches. Just because you cat stays inside doesn’t mean he doesn’t need proper medical treatment to resist common illnesses. According to veterinarian Dr. Eric Barchas of Catster Magazine, the three vaccines that should be considered for most cats are rabies, FVRCP, and leukemia. Speak with your vet as soon as you adopt your new cat to make sure you are treating all your pet’s health needs. Tip: Invest in pet insurance! You’ll be happy you did. Neutering and spaying are simple surgeries that are followed by a relatively short recovery period. For females, spaying will allow you to avoid enduring your cat’s heat cycle, which is accompanied by loud yowling, spraying urine around the house (to attract a mate) and a possible litter of unplanned kittens. For males, neutering your cat will lessen his urge to fight other cats or to escape. If you fill your cat’s kibble bowl every time it’s empty, you’re feeding him too much. Many cats that become overweight do so because food is always available. Obesity can shorten your cat’s lifespan and cause him to be less mobile. It’s important to follow label instructions on cat food and check with your vet about how much to serve your cat each day to ensure a healthy weight. Additionally, cats are carnivores and need substantial amount of meat for protein. Many cheap cat food brands fill their products with grain fillers that may leave your cat without the sufficient nutrients he needs to live a long life. Make sure you are investing in quality cat food. Your new pet may end up eating less of the good stuff, as a little bit goes may go a long way in terms of providing the nutrients he needs to stay full and healthy. According to the American Humane Association (AMA), there are roughly 60 million feral and homeless cats in the US, many of whom carry diseases that could be passed on to your cat if he comes into contact with them. Additionally, allowing your cat to roam, especially if he is new to your household, could mean he never makes his way back. 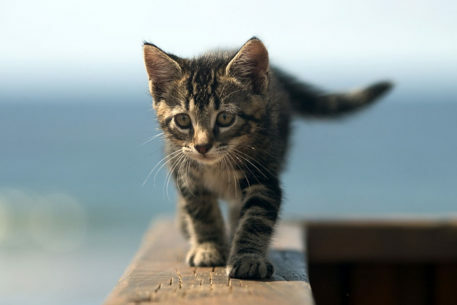 Therefore, if you plan to take you cat outdoors, the AMA suggests keeping him on a leash or secured in a confined area where you can keep an eye on him. Also, if you choose to let your cat outside, it is doubly important that you take your pet to the vet at least annually for lifesaving vaccinations, as well as parasite screening and treatment (refer to #2 above).